I spent the week at Summer Writing Adventure Camp. At Seashore Family Literacy, on the central Oregon Coast, learning and laughing with a group of delightful young writers, ages 9 to 14. Combining creative writing with high-energy explorations, we hiked Cape Perpetua, crawling beneath the 500-year-old Giant Spruce tree; walked the span of the Alsea Bay Bridge, with cars rumbling beside and the bay lapping below; traveled by public bus to Newport's Nye Beach, where we toured an art gallery and invited visual art to inform our literary art; kayaked through the Alsea Bay and Lint Slough, spotting herons and hawks. We learned restaurant manners in an artful cafe. And created dance sentences and movement machines. And, with Pablo Neruda as our guide, we asked unanswerable questions. We listened, touched, tasted, and laughed. We read together. We grew still and quiet. We wrote under and through, around, and about — poems, stories, sillyness and seriousness — then learned how to shape, polish, revise. 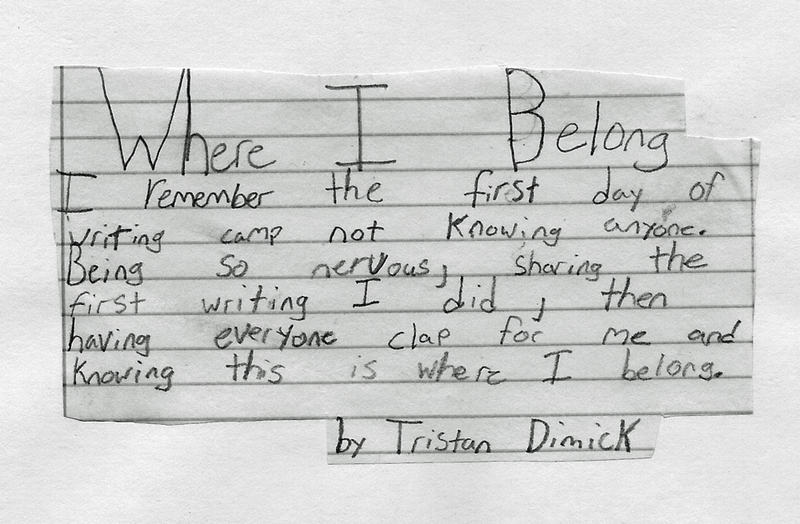 Like Tristan, for five full days I knew where I belonged. Thankful Thursday lasted all week long. Newer PostAre you Pliable or Payable?